Keyword Difficulty on SEMrush estimates how hard it would be to use SEO on a new webpage to hypothetically outrank the web pages that are currently ranking on the first two pages of Google. This metric can be extremely helpful to SEOs during the keyword research process in order to determine which target keywords are realistic to go after and which ones would be too difficult and waste your time and resources. The score is a percentage from 0 to 100 and the higher the percentage, the more difficult SEMrush predicts it would be to rank for. To calculate keyword difficulty, SEMrush takes into consideration the authority of the domains that are showing up on the results page and then estimates how hard it would be for a new website to outrank its current competitors on the SERP. In order to rank for a keyword with difficulty over 80%, you would need to invest in SEO and link building practices. If you are working with a brand new site, these keyword targets most likely would not be worth your time. Getting on the first page for keywords in this range won't be easy, but it is more realistic to target a keyword in this range compared to a keyword over 80%, especially if your website has some authority in your market. These keywords are the easiest to rank for but the hardest to find. Keywords with difficulty below 60% that also have steady search volume represent your best opportunities for ranking your pages with SEO. Go to the Keyword Difficulty tool, enter up to 100 keywords you’d like to analyze and click the Show Difficulty button (1). The keyword difficulty index (from 1-100%) shows you how difficult it would be to out rank your competitors (2) in the Google or Bing top 100 with the specified search terms and phrases. The higher the percentage, the more effort it will take to outrank your competition for each targeted keyword. To calculate the difficulty of a keyword, we analyze the top domains that are ranking in the first twenty organic search results for the given keyword. Based on each website’s SEMrush Rank, we calculate its domain strength and define its keyword difficulty. By sorting results according to difficulty in ascending or descending order, you’ll be able to discover the most and least competitive keywords. In the SERP Features section you can see which features, if any, are present on your target keywords’ results pages. This information helps you estimate the chance of getting extra organic traffic, understand what content your website might need and consider the relevance of each ‘ticked’ SERP Feature for your business. 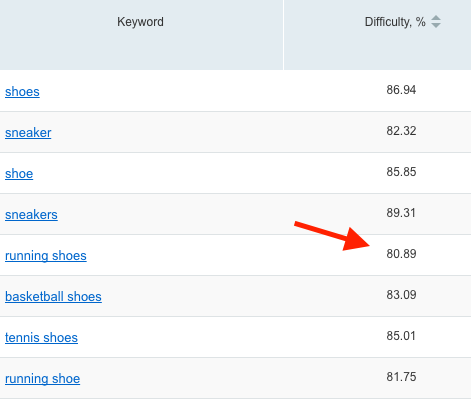 By estimating different keywords' levels of difficulty, you can determine which ones will require the most time and effort to get high rankings for them. You will also define which search phrases are easiest to rank for. Just be patient, keyword discovery is hard work that can result in higher rankings and traffic. Understanding the level of competition for keywords in purely organic results will help you adjust your SEO strategy and focus on the right keywords. Lower difficulty keywords, while not as high volume, are much easier to rank for and over time can really add up to boost your overall keyword profile.